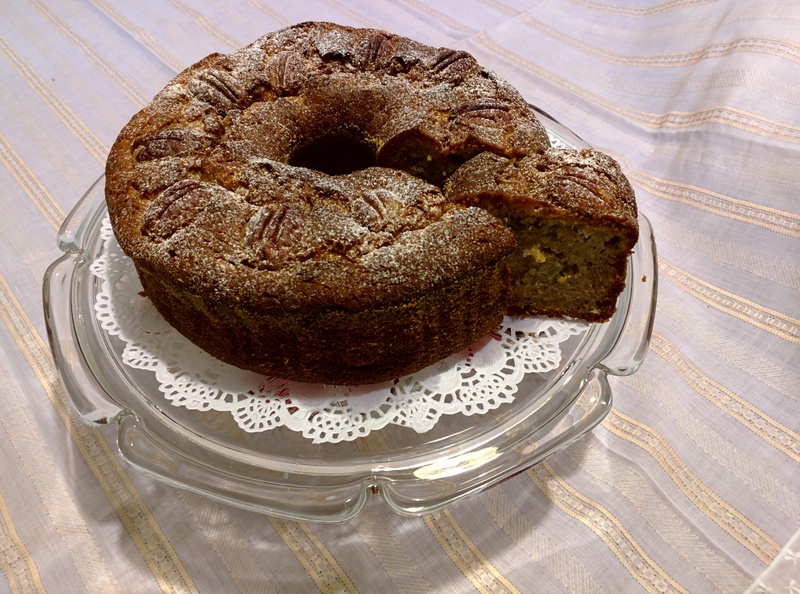 An apple, some pecans and a couple of over-ripe bananas are a perfect base for this moist cake. Even better, the ingredients can be mixed up in one bowl, making it a super easy cake to bake for your favourite afternoon tea. 3/4 green apple (cut into eighths and then into small,thin pieces). 1/4 cup finely chopped pecans and some whole pecans to decorate the top (walnuts can be substituted). Sift the flour, cinnamon, allspice, and baking powder into a bowl. In another bowl whisk sugar, vanilla extract and the lightly beaten eggs well until they are a pale yellow. Using a wooden spoon, mix in the bananas, oil and the orange zest. Stir in the flour and spice mix in batches, making sure that it is well combined after each addition. Add the finely chopped apple and the pecans, mixing them through well. Pour the cake batter into the prepared bundt tin and arrange pecan halves around the cake. Sprinkle the top lightly with cinnamon sugar and put into the oven. Bake for about 50 mins or until the cake is golden brown and a skewer comes out cleanly. Set aside for 4 minutes and then upturn onto a rack to cool. Sprinkle with a whisper of icing sugar and serve with a good dollop of double cream or yoghurt. A nice blend of ingredients – I can smell it from my kitchen!